The first thing that I noticed is that not every band out there likes to put itself in the spotlight. Honestly, business wise, that might be rendered as bad decision, especially if that band is planning to stick around for a little while longer. However, there is always an official website that could be a suitable reminder that something is still going on. Not always it has to be “…if you aren’t on social media, you are bound to fail or fall under the radar…”. 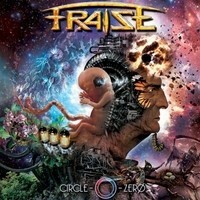 Recently I was approached by the Swedish Heavy / Power Metal band FRAISE, a foursome crew that has been out there for more than a decade, releasing four albums, with the latest one just popping out, called “Circle-O-Zero”. I got interested, and not because I couldn’t find them on social media, but because a band that has been dealing on its own for such a long time, deserves a rightful intention. The key element that can be easily transpired out of “Circle-O-Zero” is simplicity, out in the open, reflecting the basics, yet in a colorful manner. FRAISE declared that they are up for the flow, keeping it alive and breathing, sailing through catchiness and atmospheric melody that boasts into one’s heart. Unless they have gone soft, or virtually wanted to take a peek into what sounds smooth, FRAISE took a dive into melodic Hard Rock made by Euro hands and indulged it upon their Heavy Metal directive. Other than bits and piece of what appeared to be progressed, the songwriting is clear enough, not letting you think too much or expect for a wicked surprise, fetching the highlights of each tune and letting it shine. It worked far more than failed. Furthermore, it a bit struck me that it sounded like the Swedish, but heavier, version of the Swiss CRYSTAL BALL, yet with the original vocalist, Mark Sweeney, at the helm, so to call it bad would be straightaway wrong. Even though at times I felt the chill in their tunes, and thanks to their vocalist Ola Hedman time and time again it was proved as reality, “Circle-O-Zero” created a good company of renowned songs. The slow to mid-tempo heavy Metal glamour of “Freedom Messiah” ascertained a slight Traditional Teutonic Metal al’a early ACCEPT, a true killer, screaming the basics with finesse. Continuing with another catchy tune is “Red Alert”, retaining the band’s contemporary Power Metal vision into clarity but without letting go of Hard Rock elements to keep the surroundings a bit warmer. “One By One” is sliding in a cool mixture of past and present, celebrating the Rock while also rejoicing the Metal, modern Hard N’ Heavy, out for the charge. The merit of selecting an opener is so crucial for any album out there. FRAISE decided to open their gates with a speedy Power Metal assault with the title “Perfect Parade”, a bit cliché in its lyricism, but prevailing on its musical, hard to the bone Metal anthem. From where I see it, this band needs to advertise itself more, far and wide as possible. Their fourth creation clearly proves that they are good, choosing to protect the flame but also willing to step forward for just a little bit to satisfy more than the traditionalists.